This year’s report again shines a spotlight on the ways mobile is altering internet consumption and sales. While the presentation didn’t surprise many—mobile is growing at a much faster clip than internet usage as a whole—the statistics shed a lot of light on why mobile is so successful and how some trendsetters are using those trends to their advantage. The average person spends three hours each day using internet-based services on his or her phone. Five years ago they were spending less than one hour on mobile web activities. Time spent on mobile devices overall has doubled in two years, from two to four hours a day. 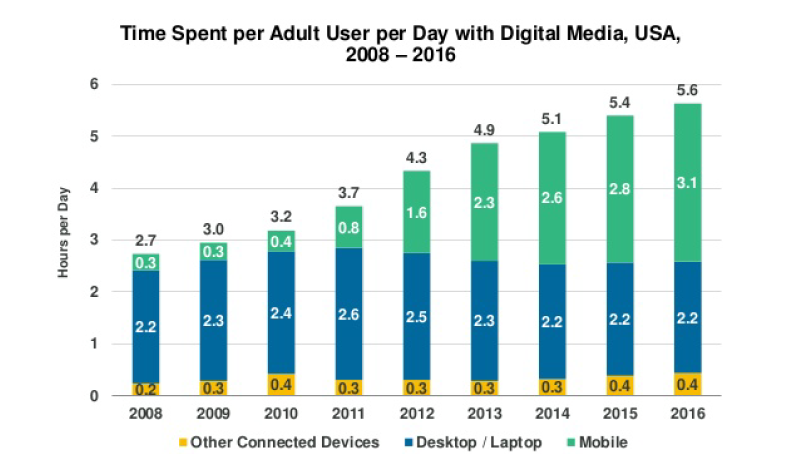 While internet usage in the U.S. continues to grow by 4 percent year-over-year, desktop usage has stayed relatively flat since 2008. Mobile usage is winning a larger piece of the internet pie than ever before--including, of course, mobile fundraising. Perhaps even more importantly, advertising engagement growth is driven primarily by mobile, and advertisers are increasing their mobile spending year-over-year while desktop spending has remained steady since 2012. As an industry, mobile advertising has grown from $2 billion in 2012 to $47 billion in 2016, show how important it is to engage customers of various brands. Those who aren’t spending more are in the minority. Because your donors, volunteers and other champions are increasingly using mobile to access the internet, you’ll need to engage them on their terms. Give by Cell can help with that. Give by Cell is the top provider of mobile engagement tools. Our suite of mobile services allows thousands of nonprofit organizations to empower their audience to donate on the spot using their mobile phones. Mobile Donate allows supporters to donate any amount by texting in a keyword to receive a link to a mobile-friendly donation page and paying with a credit card. Mobile Give allows nonprofits to accept donations via the donors’ mobile phone bill. Our suite of mobile services includes other options to boost fundraising further. “More than ever mobile user engagement is incorporating gamification to better reach and convert users,” Meeker said. Through traits like puzzle-solving, competition, project completion, exploration and discovery and creative storytelling, engagement and learning is optimized, she said. Gamification has helped many consumer services, from education vehicles to energy conservation and fitness apps. That’s why Engage by Cell offers the Screencast fundraising thermometer, which encourages donors at events to reach goals and compete against each other at the same time. Communicate with various delineated groups or one-on-one using text messaging (SMS and MMS). Send your communications right away or schedule them by time or sequenced workflow. The control is completely yours. Our services are also easy to onboard and administer, saving your company from bringing in your IT team. At a time when the vast majority of emails go unopened, nearly 99 percent of text messages are read within a few minutes of delivery. Want to learn how your organization could benefit by kickstarting your mobile fundraising engagement strategy? Sign up for a FREE 20-minute demo. Call us at 415-615-0150 or email at info@givebycell.com.